Absolutely amazing mare our of Peleng. Peleng was a very popular stallion at the Tersk Stud in Russia. He sired 100+ purebred Arabian foals, many of which are champions in haltershows and under saddle. Peleng is a son of the great Nabeg, a sire at the Tersk Stud. He was raced with success and after his racing carreer he sired the likes of Nariadni and Princip. Nabeg was by Arax, the Leading Russian Sire for 10 years, an impressive achievement! He carries a line to Ofir as well through his maternal gransire Wielki Szlem. Arax was crossed with the legendary broodmare Nomenklatura. She produced 11 purebred foals, many of which are champions and have been fantastic producers. Peleng's dam was Palmira, dam and granddam of quality offspring that have proved themselves as very good sires and dams. Palmira was by the Elite Sire, Salon. Salon sired many great stallions, among which are Pesenka and Namiet. His lines trace to Skowronek through his sire Negatiw. Salon was bred to the great mare Ptashka, who was a race winner and dam of several incredible producers. Her offspring were regarded as very valuable and were raced with great success. Mahrouska's dam was Lemya, a daugher of Muscabar, who sired 30+ purebred Russian Arabian foals. He is the son of the great Muscat. Muscat was the 1980 American Triple Crown winner, US National Champion, Canadian National Champion and Scottsdale Champion. He was a fantastic race horse and sired many champion offspring. Muscat was by Salon and out of the race winning mare Malpia. Muscabar's dam was Karhonova, a daughter of the fantastic sire Nariadni, who is a son of Nabeg. Karhonova also carries a line to Witraz through her dam Bint Elba. She also carries several lines to the great sire Naseem. Lemya's dam was Lena, a daughter of Nasmeshnik, a very good sire by Arax out of Neposeda, a daughter of the great producer Nomenklatura. Mahrouska is a gem in our program, as she is very classically Russian bred. Her lines include as many great Russian ancestors and there is almost no Egyptian influence in her pedigree. Her lines are very valuable and complement our program very nicely. Available for breeding to all Arabian stallions. If the foal is purebred Straight Russian, we prefer you choose a Russian name for it, however this is not oblibatory. Please check open foaling years below. Alyona is a real Russian beauty, sired by the great stallion Vadeer, who hold 3 trackrecords in Russia. He sired many stakes winning offspring. Vadeer was by the Swedish National Champion stallion Mamluk, a son of the fantastic sire Aswan. Through Aswan, Vadeer's lines go to Nazeer. Mamluk was out of the great mare Monogramma. She was a legendary dam at the Tersk Stud in Russia, where she foaled the likes of Monogramm and Malutka. Her granddam was Mammona, the 'Queen of Tersk', dam of many winning offspring. Vadeer was out of Viola, a daughter of Naftalin and out of Salvia. Through her, Vadeer's lines go to the very prominent racer and sire Priboj. Alyona is out of Mirror Manor's straight Russian mare Poupée Russe, who was exceptionally leased to us to produce a foal for our herd. She is a live show champion and produced several show winners already. She is by the international show champion, Mirok Monpelou, who is a son of the great Vatican. Vatican was a European Champion Stallion, stakes winner and sire of many race winners and champions. His sire line goes to the French import Kann, the first stallion to stand at the Tersk Stud. Poupée Russe was out of the beautiful mare Matrioshka, a daughter of the Elite stallion Antey, whose lines go to Aswan and the incredible producer Nomenklatura. Matrioshka's dam was Monogramma. Alyona is a rare black Straight Russian with great bloodlines that include fantastic perfomers. A perfect broodmare if you're looking to breed a good performer with classic Arabian beauty. Available for breeding to all Arabian stallions. If the foal is Straight Russian, we prefer that you choose a traditional Russian name for the foal, however, this is not obligatory. 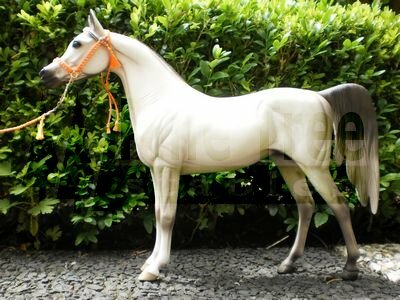 Available to Arabo-Teke stallions as well. Please check open foaling years below. Nedezhda is a very beautiful pure Russian mare sired by Massai Ibn Marenga, wo is a multi show champion. Massai Ibn Marenga has sired many winning offspring and was awarded the Gold Premium Stallion title. He is by the international Champion Stallion, Mikoran. Mikoran is a grandson of Russia's greatest race horse and super sire, Vatican. His lines include Aswan, Priboj and Arax. Massai Ibn Marenga is out of the champion mare Marenga, a daugther of the great sire Menes. Nedezhda is out of the pretty mare Nadbavka, a daughter of the fantastic stallion Balaton. He was named European Champion and multiple National Champion in Holland in his flourishing show carreer, and then went on to sire champions. Balaton is a son of great sire Menes, and out of Panagia. 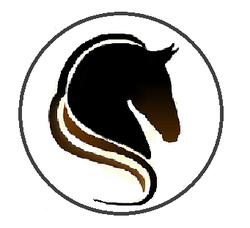 Balaton's lines include the great stallions Salon, Awan and Ofir. Nadbavka is out of Nema, a daughter of the legendary sire Moment, who was the senior sire at the Tersk Stud in Russia. Moment sired numerous race winners and halter champions. Furthermore, Nema's lines include Negatiw and the great mare Nomenklatura. Nedezhda's pedigree is packed with champions and beautiful pure Russian horses. She is exactly what you are looking for if you want to breed a foal with a classy look, good movement and great lineage. Available for breeding to pure Arabians only. Please check open foaling years below. Mascha is a beautiful mare with amazing movement and a classic head. 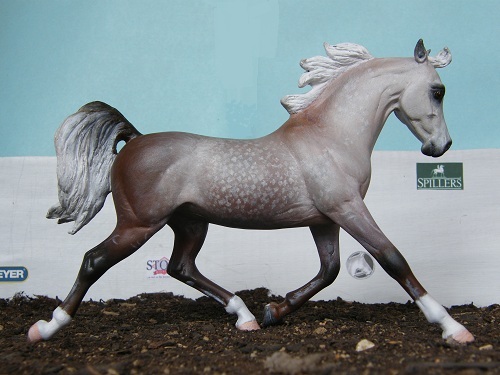 She is by Mirror Manor's stallion Daidarabocchi, a gorgeous dapple grey son of Nimroz. Nimroz was a great sire and also a race winner. He was by Moment, race winner and sire of numerous international performance champions and stakes winners. His lines trace to Naseem and Skowronek through Salon. Nimroz's lines also trace to Arax through Nabeg, and to Nazeer through the great sire Aswan. Daidarabocchi's dam was Narcissa, a daughter of the great Vatican. Vatican was Russia's greatest racehorse, winning 6 Stakes races including the Derby and St. Leger. Mascha's dam is our own Straight Russian Arab mare Mahrouska. She is a daughter of the great Peleng, sire of halter and performance champions. His sire is Nabeg, who was an incredibly influential sire, also through his progeny. Peleng's dam was Palmira, dam and granddam of champions. Her progeny have proven themselves as great sires and dams. Mahrouska was out of Lemya, a granddaughter of the fantastic racer and sire Muscat. Mascha is one of Daidarabocchi's best daughters. She is an asset to any pedigree, as she carries lines to many of the great Russian ancestors. Available for breeding to Russian Arabian stallions ONLY. We prefer to have a picture of the progeny, but BSO is accepted. We would like the foal(s) to have traditional Russian names if they are straight Russian Arabs, but this is not obligatory. Crosses between Arabian strains are also allowed, as long as the sire has at least 50% Russian Arab blood.